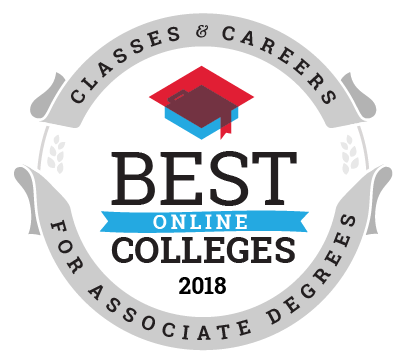 To earn a place on the Best Online Colleges for Associate Degree Programs ranking list, an online college must meet two criteria. First, they must offer their online associate degree programs at an annual tuition rate that students can reasonably pay off within 10 years of graduation. Second, they must offer a large number of associate degree programs to students (minimum of 10). 20 University of Phoenix-Arizona Tempe, AZ 21 $11,219 . $11,219 . 102 West Virginia Junior College-Morgantown Morgantown, WV 12 $11,665 . $11,665 . Offer their online associate programs for a reasonable annual tuition rate - $21,300 is the upper tuition limit (annual in-state tuition) for this list. The annual salary for those with an associate degree, according to the BLS is $42,588. Bankrate recommends that students not accumulate more student debt than they will make the first year after graduation. As associate programs are typically 2 years in length, we used $21,300 as the annual tuition maximum. Offer a large number of online associate programs in a variety of study areas. We used 10 as the lowest number of associate programs an online college could offer in this ranking list. If these conditions were met, online colleges were sorted from top to bottom based on the number of online associate programs that they offer to students.